Whilst many voices proclaimed that our world is in transition, the 21st December 2012 was wrongly portrayed as an apocalyptic ‘End of the World’ event. The so-called ‘Mayan Apocalypse’ came and went and nothing appeared to happen, but that is because most have been looking in the wrong direction. For the last 25 years or so, our world has been facing a major cosmic onslaught and the evidence is now overwhelming that we are facing a New World Age where Space Weather will dominate how humans are able to live on planet Earth. NASA Science News, 4th June 2010. 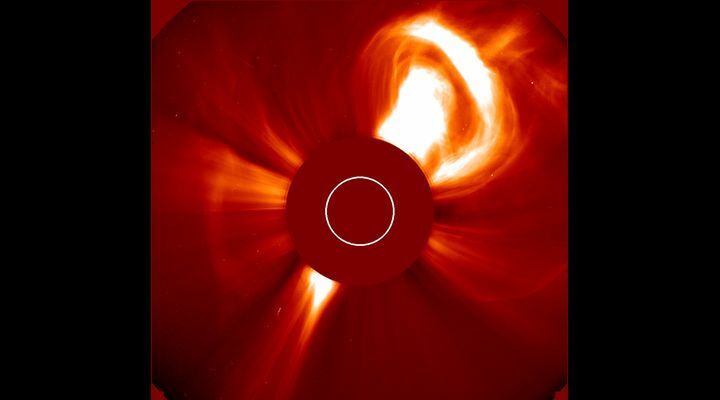 Are you aware that NASA and the European Space Agency have been releasing a variety of ominous press releases in recent years concerning Space Weather? In short, our planet is being blasted by cosmic energies at the same time that Earth’s planetary and solar system defenses are deteriorating with many repercussions that affect the future of mankind. 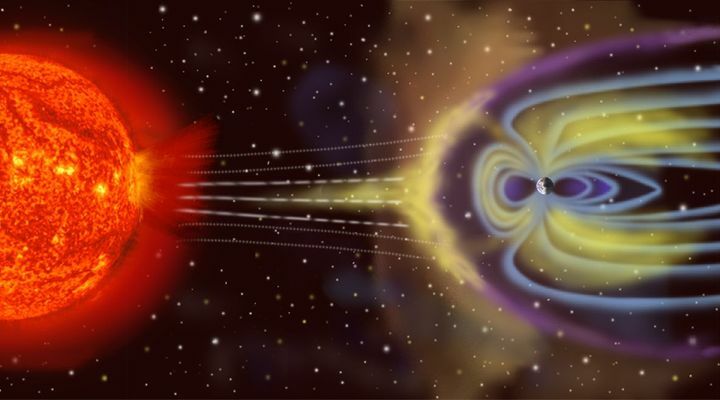 Earth is surrounded by a magnetosphere, a complex magnetic field that acts like a cosmic umbrella, a bubble in space, tens of thousands of miles wide. It was a fairly reliable protective shield from the worst effects of space weather, but things have changed. 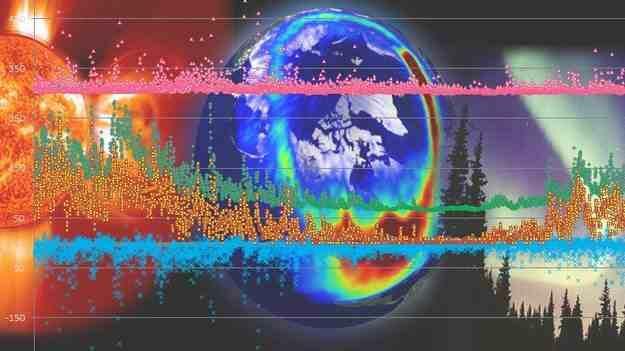 In September 2008, a NASA press release revealed that our planet is now being flooded by galactic cosmic rays as part of a long term trend that started in the mid 1990s. Shockingly, astronomers openly speculated that the shielding around our solar system might ‘evaporate’. Like opening the windows to allow in some fresh air, it seems that Mother Earth is deliberately lowering her shields to allow in more New Energy. NASA has reported that there are massive breaches where Earth’s cosmic protection affectively disappears on the daylight side. 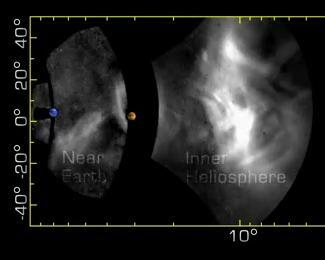 The entire day-side of the magnetosphere is open to the solar wind. 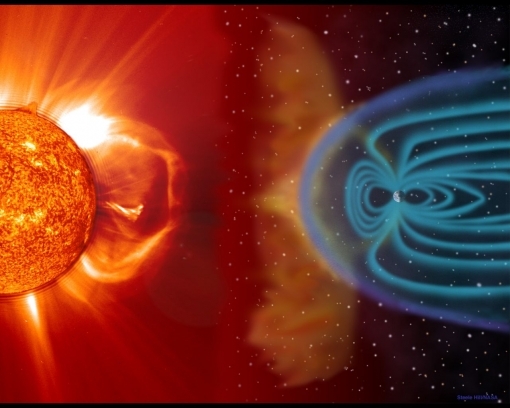 Earth’s magnetic field no longer fully protects against Space Weather, but neither does the atmosphere! In 2010, the European Space Agency press release, Multiple rifts in Earth’s magnetic shield, made the following claim. Less than three years later, in October 2012, the European Space Agency disclosed that Earth’s cosmic shielding had dramatically deteriorated. Geoscientists have realised that theories that seek to blame an anthropogenic (manmade) cause for climate change are incorrect. In 2011, an international conference was attended by scientists from 30 countries that heard 200 presentations with research papers included in a massive 600 page final report, “NATURAL CATACLYSMS AND GLOBAL PROBLEMS OF THE MODERN CIVILIZATION”, Geocataclysm 2011. 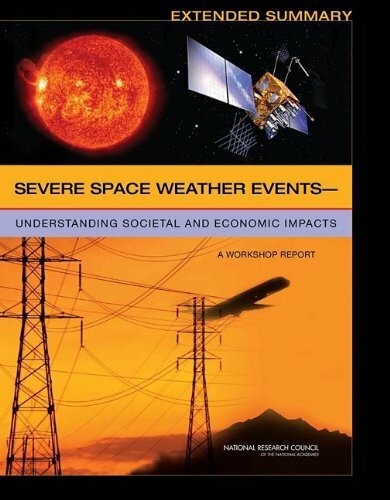 In 2009, a NASA commissioned a report conducted by the National Science Foundation warning that a solar “superstorm” could have serious consequences. 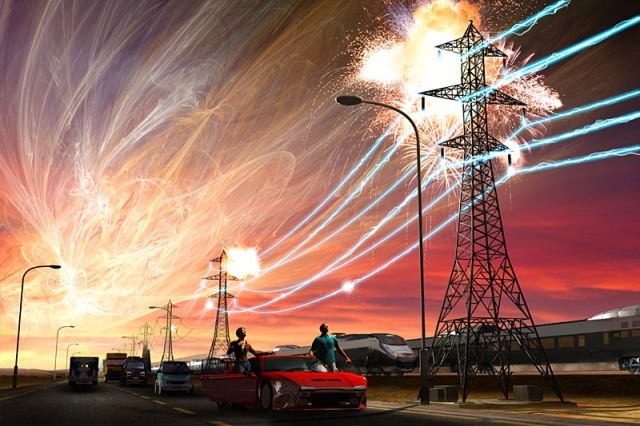 Earth’s communications satellites could be knocked out and dangerous power surges in the national grid could destroy transformers and disrupt crucial navigation aids and aircraft avionics. 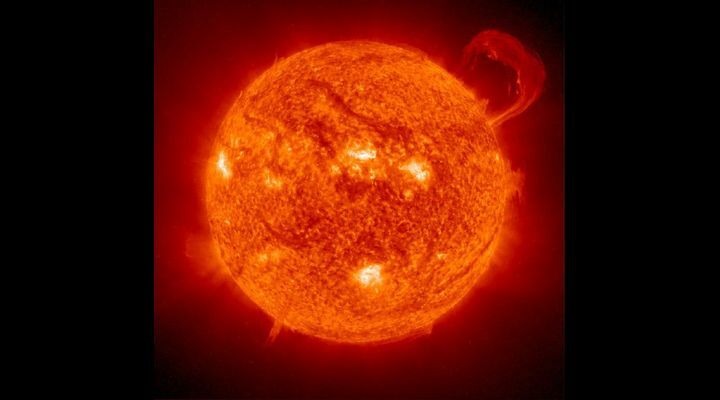 We can expect an extreme solar storm about once every 150 years caused by the Sun ejecting a trillion tonnes of highly-energetic matter travelling at a million miles an hour and then hitting the Earth. The major solar storm known as The Carrington Event occurred in 1859 so we are already overdue. Yet, this apocalyptic event is impossible to predict more than about 30 minutes before it actually happens. Regardless, world controllers are taking action to prevent a total meltdown of the technological infrastructure of our modern world. However, according to NASA scientists, almost nothing is immune from space weather. Here are some of the most important impacts on human activities and welfare. Source: Professor Michio Kaku, of the City University of New York. The UK military have already understood the issues and back to basics military exercises without GPS have been undertaken. Obviously, due to worsening space weather, frequent flyers cannot expect trouble free skies. The warnings have already started informing air travellers to expect a greater radiation hazard in the following decades. Have you been wondering about all the high profile major computer system failures in recent years? Have you heard about the stock market breakdowns around the world? Massive banking meltdowns and continuous “glitches”, even ATM machines giving away free money? More cosmic rays mean more bit-flips and translates to more software and hardware corruption. 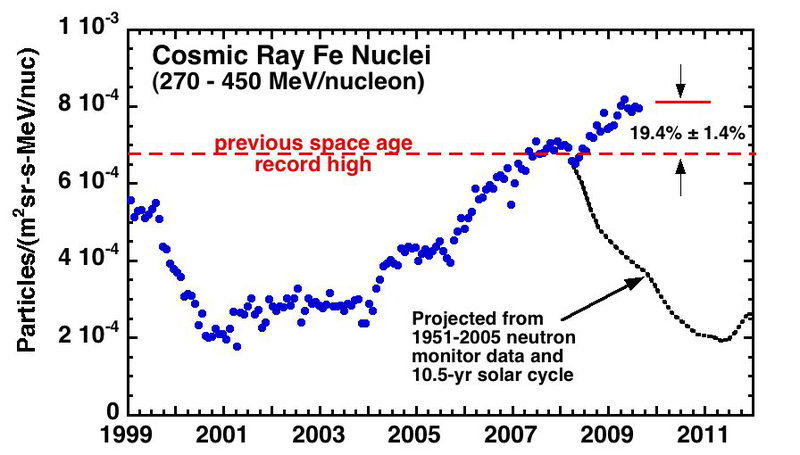 Energetic iron nuclei counted by the Cosmic Ray Isotope Spectrometer on NASA’s Advanced Composition Explorer (ACE) spacecraft eveal that cosmic ray levels have jumped 19% above the previous Space Age high. Credit: Richard Mewaldt/Caltech. In the next 40 years, Trans Atlantic flights are expected to encounter twice as much turbulence while enroute due the jet stream is being accelerated and having a destabilising effect that is making air turbulence more likely to form. Engineers are now looking for new ways to prevent autopilot systems from being corrupted by cosmic rays. 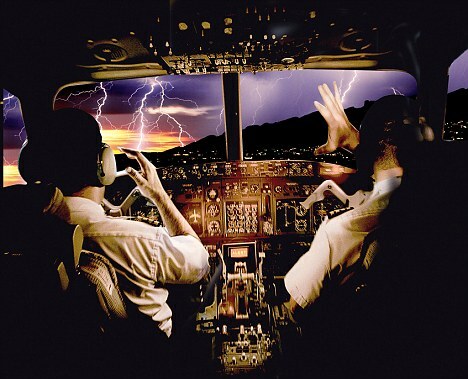 The airline industry was badly spooked on October 7, 2008, when a Qantas plane flight QF72 from Singapore to Perth was cruising at 11,000 metres when the autopilot disengaged and the plane suddenly plunged 200 metres in 20 seconds. Three minutes later it plunged a further 120 metres, this time over 16 seconds. 122 crew and passengers, 13 seriously were injured. A few atmospheric scientists are concerned. There are extreme flashes of gamma-ray energy that explode in Earth’s atmosphere. This ‘dark’ lightning delivers a million times as much energy as the radiation in visible lightning. If an airline passenger is in the wrong place at the wrong time, they could be exposed to 400 chest X-rays worth of radiation. It’s not just solar storms, more cosmic rays and radiation that humans are now facing. Astronomers stress that Earth is experiencing an upsurge of space rocks. There are so many asteroid flybys that some compare this to Earth being in a cosmic bowling alley! The belief is that it’s a matter of when not if Earth will get hit by an asteroid and this means the inhabitants of Earth need an effective asteroid detection and deflection system. This was sharply brought to the attention of the general public when asteroid 2012 DA14, passed Earth on Feb. 15, 2013 at a minuscule astronomical distance of just 27,700km (17,200 miles). Some astronomers believe that a piece broke off and entered Earth’s atmosphere. The estimated 55-foot (17 m) 10,000 tonnes meteor exploded over Russia with the force of about 30 nuclear bombs, injuring more than 1,200 people in the city of Chelyabinsk, causing extensive damage to city buildings. NASA sought to prevent public disclosure of an important 272 pages Planetary Defense Report that provided the underlying analysis for NASA’s recommended conclusions strategy recommendation. An abbreviated version (28 pages, pdf) was provided to Congress and the public in March 2007, recommending against the initiation of a new planetary defense program. So, it is no surprise that when NASA administrator Charles Bolden Jr. at a House Committee hearing was asked in March 2013 what America would do if a meteor similar to the one that hit in Russia on February 15th 2013 was found to be on a path toward New York City, with impact three weeks away. His response was the only thing we could do is “Pray”. 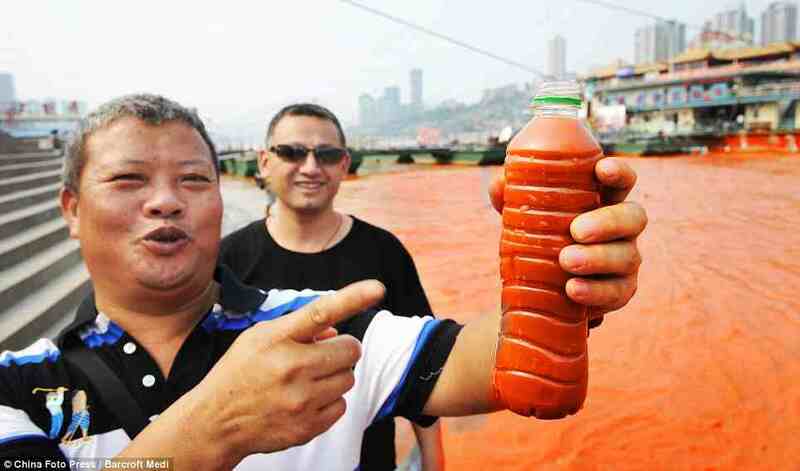 Have you read that oceans, lakes and rivers are occasionally turning blood red all over the planet? Have you heard what sounds like ‘trumpets’ in the heavens? 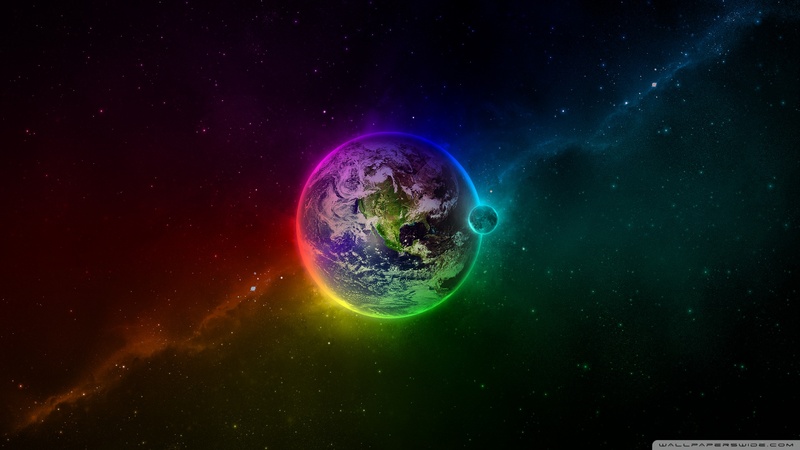 Should humanity be paying attention to Biblical Prophecy and esoteric astrotheology? In December 2012, Reuters reported the results of a poll by the Public Religion Research Institute in partnership with the Religion News Service found a considerable proportion of U.S. citizens think we are in the “End Times”. 36% thought the severity of recent natural disasters such as Superstorm Sandy is evidence the world is coming to an end, as predicted by the Bible, while more than 63% blame climate change. Regretfully this small group of New Age leaders had no idea why they were being asked, but it is now clear they were being tested. Recent revelations prove that major religious institutions, metaphysical and esoteric groups have been tracking the date 2012 as the end/start of a major astronomical cycle. “Cortez and Montezuma at Mexican Temple” Scene from the frieze decorating the United States Capitol Rotunda. Painted sometime between 1878 and 1880 by Constantino Brumidi. It features the Aztec Calendar Stone and other important Masonic symbolism. This new cosmic dispensation was expected by those who have preserved ancient knowledge about the existence of long astronomical cycles. Strong evidence suggests an assortment of religious, metaphysical, esoteric and indigenous groups were using calendars derived from ancient knowledge that were carefully preserved to keep track of the time when we could expect a major period of cosmic transition and possible conflagration. According to scientists, there is a belief that planet Earth is being swamped by a new stream of dark matter. Certainly, there is new evidence that the spacetime around Earth is changing and the European Space Agency have a new mission to determine what is going on. The realm of the quantum is the fundamental source of spiritual energies, so spiritual leaders in theory should understand exactly what is going on. The issue of planetary challenges is because the violent delivery mechanism is causing problems for our modern technological world! Finally, more and more scientists are admitting that evolution is driven by changes in the environment and that organisms will intelligently engineer their own DNA and control their own evolution in response to environmental stress. This means that natural selection over hundreds of thousands of years has been superseded by evidence that genetic changes can appear quickly in a matter of 15 generations and that translates to decades.